The rally, riots and deadly violence in Charlottesville, Virginia, last summer left the nation in shock and forced us to face a brutal reality — that hate and bigotry long simmering in the shadows had erupted into the mainstream. 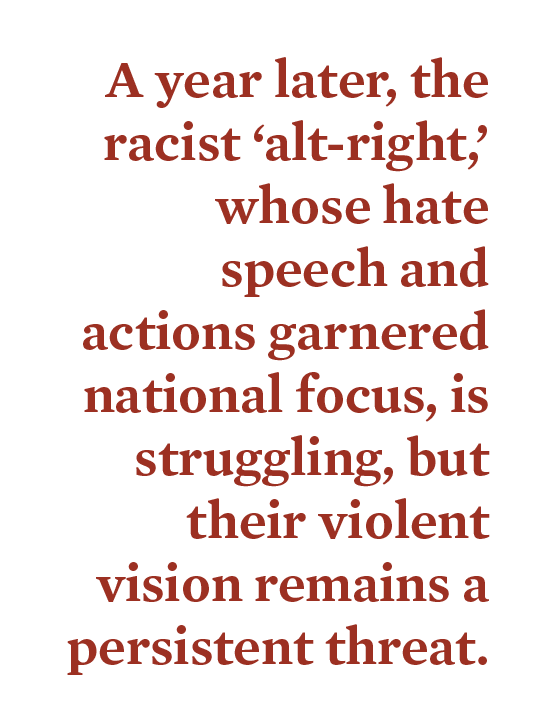 A year later, the racist “alt-right,” whose hate speech and actions garnered national focus, is struggling, but their violent vision remains a persistent threat. As the Southern Poverty Law Center documented after President Trump’s election, bias incidents became a daily reality and hate crimes targeting the nation’s most vulnerable communities became a national nightmare. In “The Invisible Hate Crime,” an in-depth report about the savage murder of a young woman with disabilities in Pennsylvania, we call attention to a type of hate crime that is sadly far from rare, but unsurprisingly underreported, under-investigated and under-prosecuted. In the article, we describe specific ways to address disability hate crimes, but we also encourage thinking broadly about how to improve the monitoring and reporting of all forms of bias-fueled crime. This issue, we also delve into how FBI, state police and local authorities worked together to take down the white supremacist group Aryan Strikeforce. Its members formed a multi-state conspiracy across the East Coast — buying and selling guns and drugs to fund the activities of their dangerous hate group. After an extensive investigation lasting more than three years, seven of Aryan Strikeforce’s most violent members now sit in jail facing 33 total charges, including conspiracy, racketeering and money laundering — leaving the organization in shambles. Yet even as specific groups crumble, the threat of violence brought about by hate movements and ideologies continues — often motivating crimes committed by lone wolf actors, as we discuss in “One Year Later: Leaders From ‘Unite The Right” Fall From Grace. Though the racist “alt-right” in particular has struggled to maintain unity and clear leadership in the fallout from Charlottesville, their bigoted ideas, which give birth to real-life violence, are as present as ever. And as the alt-right and its political apologists are spreading hate, successfully grabbing the national spotlight and becoming highly visible, vulnerable groups are struggling against discrimination, fighting for recognition and remaining frustratingly invisible.